Everything has a history; an origin story that deserves to be told. At Everlast Services, we love fences. In fact, our own history is intimately tied to fences—we started off as a fencing company. So, as a company that owes our own success to fencing, we thought it was only right to explain where these wonderful inventions came from. The term ‘fence’ was first used in the 14th Century. It is actually a shortened version of the word defence (fens). This origin is important. It explains exactly what a fence is: a means of defending what is yours. A fence separates your property from the rest of the world and any dangers you want to keep out. Unsurprisingly, fences have always been closely tied to humanity and civilisation. The first fences probably sprung up in response to the agricultural revolutions, which solidified the importance of family and property. In many ways, the fence allows for private property to become institutionalised and gave birth to the sense of pride and commitment we all have to anything we own. What Is a Fence’s Main Purpose? Fences perform two roles – to mark property and to protect property. Of course, depending on the nature of the property, these roles vary. The back fence of a home is often higher, as it needs to protect the property while the front fence may be smaller, and used as a stylish way to demarcate the boundary. However, even if the fence is small enough to simply step over it still has a protective power as a symbol of something that should not be crossed. We know that what lies beyond the fence is someone else’s, and we don’t have the right to step on it. Fencing materials have developed enormously over time. During the Bronze Age, stone fences were the primary choice, while the Anglo-Saxons went for something called a worm fence, in which the rough wooden rails where crossed at an angle. This approach was labour and cost efficient, as it didn’t require posts to be driven into the ground. Hedge fencing was also a common approach, and you can still see these crisscrossing the British Isles. In fact, the Anglo-Saxons used this method because it improved the ecosystem for the land and the animals kept inside the hedge fencing. 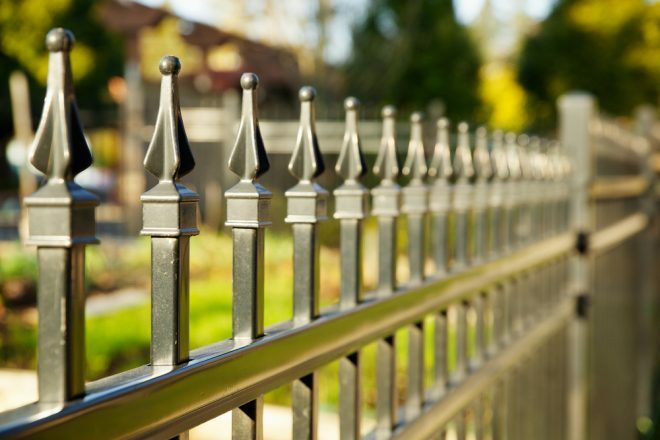 By the time the Victoria Era rolled around, decorative elements were used in fences. These decorative elements included everything from wrought iron grids to delicate motifs. These days, we create fences out of almost anything. Modern designs can be made out of anything from stone, to aluminium, Colorbond, glass and brick. Traditional designs are still seen everywhere, and no home is complete without a fence. In ancient times, if you couldn’t afford a fence, you dug a deep ditch and filled it with water to create a moat. The Dingo Fence was constructed between 1880 and 1995. It is 6,614km long and 5.9 feet high. It was designed to keep wild dogs out of southeastern Australia. The Rabbit Proof Fence was constructed in 1907. This 3,253km fence is two and a half times longer than The Great Wall of China. If you go to Ireland, you’ll see a strange type of fencing – stone fences that go nowhere. Why are they there? Well, during the Great Famine rations where only given out if you could prove you had worked. Since there wasn’t much work around, the Government forced people to build pointless fences and roads. The most famous fence in the world is The Great Wall of China. Despite its incredible height, the width of the wall is only a few times higher than the average garden fence. Although, the average garden fence probably isn’t visible from space! So, that’s the history of fences. They have developed alongside us and allowed us to make some of the most important developments. Without fences, we wouldn’t have been able to have the agricultural revolution that allowed us to move beyond subsistence and work other jobs, have weekends and travel. Without fences, we wouldn’t have such an attachment to our private property. We wouldn’t have that incredible feeling of safety and relaxation you get when you’re inside a space that is yours alone.